I took advantage of having a friend who I wouldn’t be embarrassed to make take pictures of me – and made her take pictures of me. Unfortunately, for a couple of these outfits, I forgot to do my accessory pictures, too, so here are outfits without the detail close-ups. Sorry! Also, it should be noted that almost everything I’m wearing in these two pictures are Black Friday deals. I’m not one of those people who have things with tags on them in my closet. I buy it. And I wear it – immediately. The highest-price thing I’m wearing in the outfit above is my shoes, which were about $20. 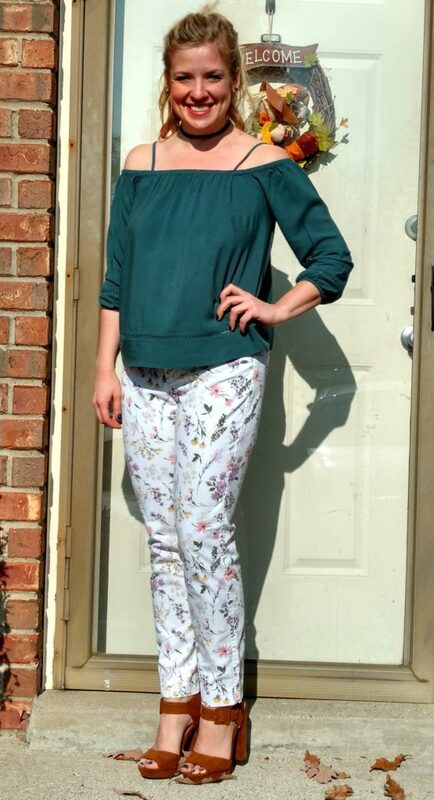 The shirt was $7.50, the most expensive thing I bought at Old Navy that day, where I also got my pants for a whopping $4.50! It was an exciting day. I was hesitant about the off-the-shoulder look for a while. Whenever I’d see it on someone, I thought it just looked so trendy that it was too basic. But, now that it’s been out a little while, there are some more variations on the theme, and I really like this forest green take on the boho look. Naturally, both of these looks feature chokers. 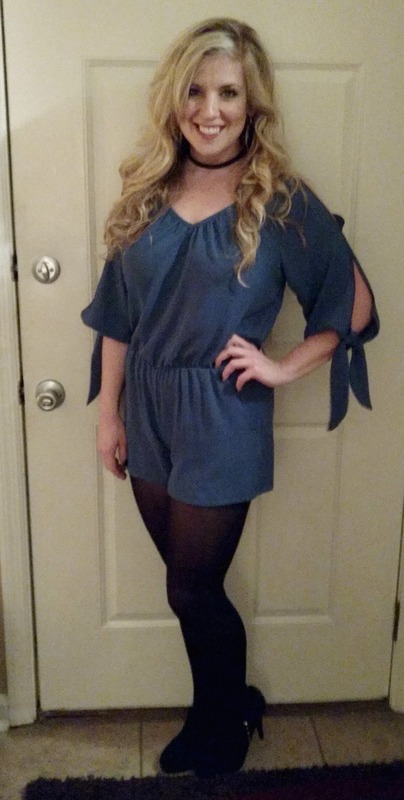 But, you all know I also love a good romper! So, when I found one I could wear in winter, I couldn’t NOT buy it (also, it was only $15, so clearly, it was meant to be). I added tights and booties and I had a simple, sophisticated evening look. What were your best Black Friday finds? Were you good at actually buying for other people, or like me every Black Friday, did you mostly just scoop up deals for yourself? It’s so hard to resist!